Sunday morning I carried my breakfast (Olive oil-fried egg on sourdough toast with tomatoes + balsamic. Try it. You’ll love it.) and latte to the backyard. Still in my pajamas I sat on an old, battered, sun-bleached adirondack and just ate and sipped. There was no rushing. No half-eaten bagels. No missing homework. Gavin was laying on the couch building his Minecraft server with a friend and Stella was planning a trip to town to film footage for a video she would probably spend the afternoon editing. The chickens walked in front of me, pausing to stretch a leg out (which is the equivalent of a chicken yawn) setting the pace for the day. Slow. Lazy. Hot. So far, I’m really feeling this summer… Are you? 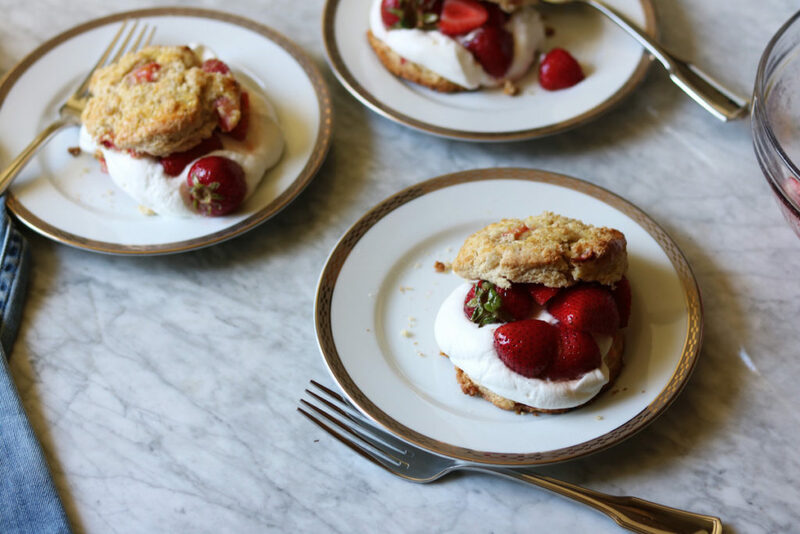 Let’s talk about this most perfect summer dessert… Why are we not just making regular shortcakes, you might ask? Simple. Because A) I love me some scones and B) I think they have more flavor and C) because we can. I wanted a dessert that would dazzle, have some make-ahead options + something that screams of summer. My mind instantly went to berries because they are so juicy and delicious right now. 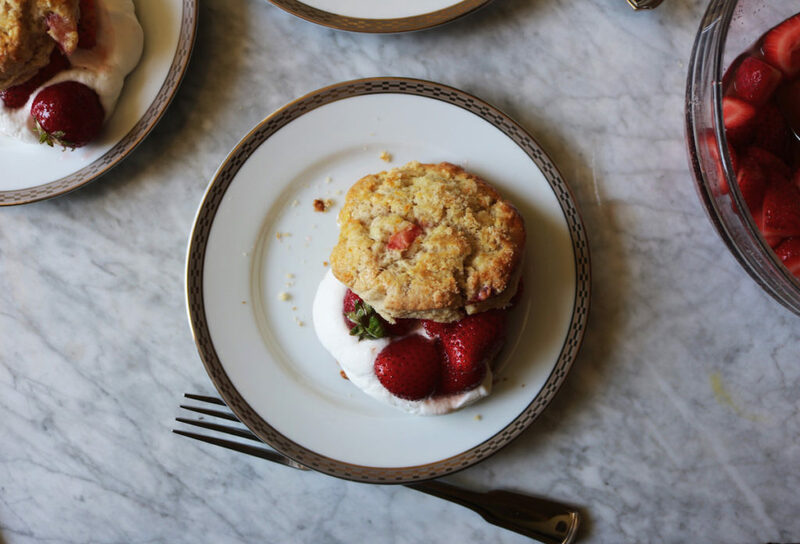 In addition to sandwiching berries in the scone-cakes while serving, we also fold cut strawberries into the scone dough to really drive home the strawberry vibe. Then we sprinkle them with orange sugar prior to baking which gives them a nice, crunchy outer crust with lots of flavor. I wanted to lace that orange essence throughout, so we throw more orange into the macerated berries + whipped cream. These are so easy + beautiful that I can’t wait for you guys to make them. I did this recipe in conjunction with a bunch of other amazing bloggers for a virtual potluck (#VirtualMidsummerPotluck4Peace). The goal was to all come together to share a little love + light. Things are tense and weird in the world right now…just an opportunity to share a little sunshine through food. This is the recipe I would bring if we were all meeting up together…I would assemble them just prior to eating, but have everything prepped ahead of time. Once everyone has posted their recipes, I will link to all of them below. A big THANK YOU to Saghar Setareh of Lab Noon for putting this together!!! Orange Blossom Water. First, don’t let orange blossom water scare you away. If you don’t have it or don’t want to use, simply omit it from the recipe and everything will still turn out marvvy. Orange Sugar. 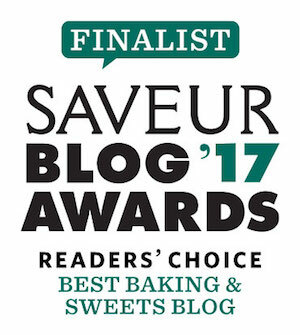 This gives the scone-cakes amazing flavor and crunch — LOVE IT. Just note you will have extra and it will rim a cocktail glass like a boss. Stored leftovers in a sealed container in the fridge will last for several weeks-ish. Make Ahead. Unbaked scones freeze beautifully. Once you get to the end of Step 4, freeze the strawberry scones solid, wrap tightly in plastic wrap, place in a freezer-safe, resealable plastic bag and shove back into the freezer. When ready to bake, simply unwrap and move onto the next step, no need to defrost but do add some extra bake time to make sure they’re cooked through. Biscuit Cutter. If you don’t have a 2-inch round biscuit/cookie cutter, flour the rim of a glass that has a similar circumference and use it. Freezer Time. I think freezer time is pretty nonnegotiable with scones. If you don’t have a freezer large enough to accommodate a baking sheet, then set them on plates. The freeze-time helps maintain their shape whilst baking, as well as get a wee bit more lift off. Top Rack of the Oven. I love to bake scones and cookies in the top rack of the oven. I like to bronze them up quick which shortens the bake time and lessens the chance of over-baking the middle all while getting a healthy golden tan on top. Know your oven…if it runs really hot up at the top, then consider using the middle rack. Cutting the Strawberry Scones. These are tender as scones are wont to be…as such, use a gentle touch when cutting. I used a sharp knife and made sure they were completely cool before cutting. 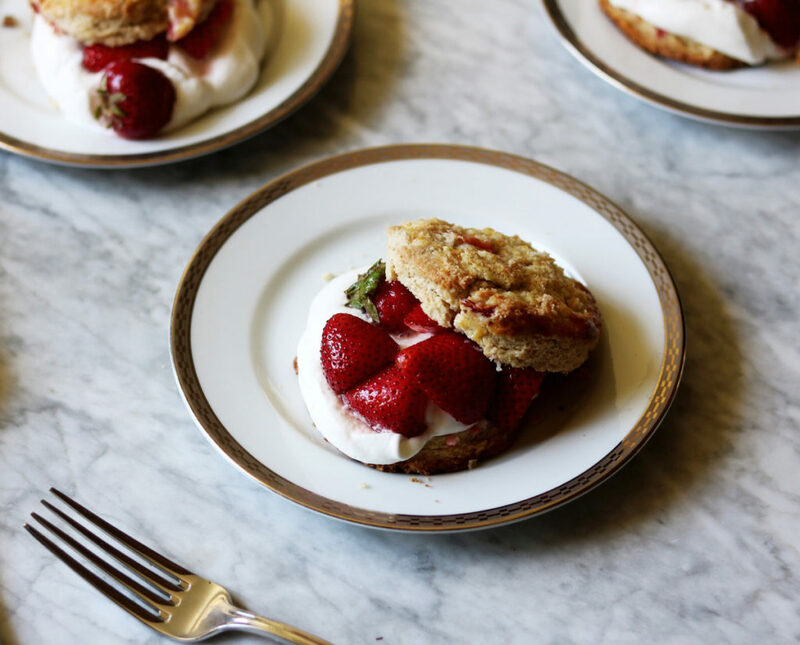 Let’s bake some strawberry scones, shall we? To Make The Orange Sugar: Add the orange zest and sugar to a food processor fitted with the blade attachment and pulse until they’re well blended, but you still see bright bits of zest. Set aside. In a medium-size bowl, whisk together the cake flour, flour, sugar, baking powder, cinnamon and sea salt. Cut the chilled butter into the flour mixture using a pastry blender, two forks or your hands. Stop when the butter is the size of large peas. Mix the 3/4 cup of cream, egg and vanilla extract together in a small bowl and then drizzle over the flour mixture. Using a fork, stir until it just starts to form a cohesive mass. Sprinkle the strawberries over the dough and gently fold them in until they are evenly distributed throughout the dough. Lightly flour a clean surface and pat the dough into a large rectangle about 1-inch thick. Don’t overwork your dough. 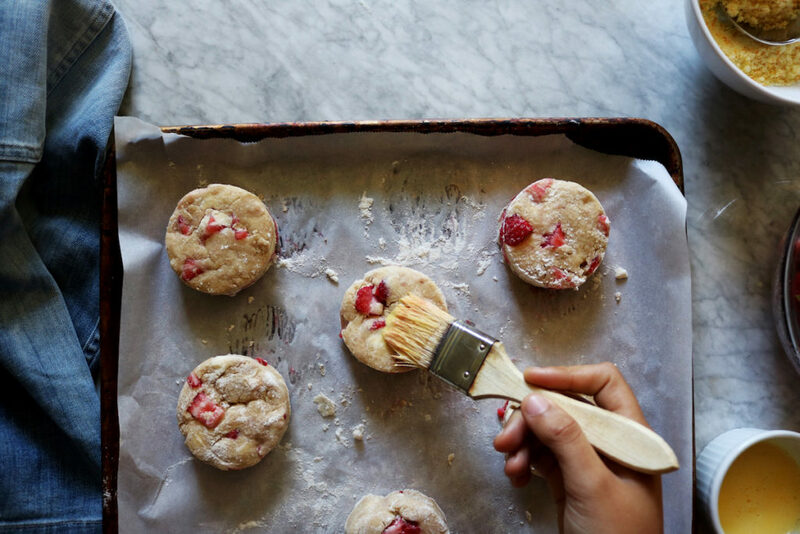 Using a two-inch biscuit-cutter (or see note above), cut 10 dough rounds, gently reforming the scraps until you get ten scones total from the dough. In a small bowl, whisk together the egg yolk + cream to make your egg wash. Lightly brush the scones with the egg wash and heavily sprinkle with the orange sugar. Place the scones on a baking sheet lined with parchment (or a silpat) and place in the freezer for at least 30 minutes. Pre-heat your oven to 400 degrees F and place a rack in the top third of the oven. Make sure the scones are at least two inches from one another and put on the top rack in the oven for 15-18 minutes, rotating the baking sheet once midway through. Let them cool on the sheet, in a draft-free area, for about 15 minutes. For the Strawberries: Add the remaining 2 cups of halved strawberries to a medium bowl. Add the sugar and fresh orange juice stirring to mix. Periodically stir so that all of the fruit is covered in juice. They’re ready when they are glossy and releasing their juices. For the Whipped Cream: In an electric mixer fitted with the whisk attachment, add the remaining 2 cups of whipping cream, sugar + orange blossom water and beat on high until soft peaks form. Using a sharp knife cut the strawberry scones in half. Top 1/2 with a large dollop of whipping cream, some strawberries and the other half of the scone. Enjoy! Not a lot on my mind except for how much I love free time. While you’re lounging read this. I also love David Sedaris. By the time you read this I might still be in my pajamas, in the same adirondack chair, hot as hell, with the latte replaced with wine, the egg replaced with hummus + Mary’s Gone Crackers (Original flavor…are you guys eating these? OBSESSED). I hope you’re able to extract some of the crazy out of your days and breath. Sending lots of love! Mix the ¾ cup of cream, egg and vanilla extract together in a small bowl and then drizzle over the flour mixture. Using a fork, stir until it just starts to form a cohesive mass. Sprinkle the strawberries over the dough and gently fold them in until they are evenly distributed throughout the dough. Lightly flour a clean surface and pat the dough into a large rectangle about 1-inch thick. Don’t overwork your dough. Using a two-inch biscuit-cutter (or see note above), cut 10 dough rounds, gently reforming the scraps until you get ten scones total from the dough. Heat your oven to 400 degrees F and place a rack in the top third of the oven. Make sure the scones are at least two inches from one another and put on the top rack in the oven for 15-18 minutes, rotating the baking sheet once midway through. Let them cool on the sheet, in a draft-free area, for about 15 minutes. 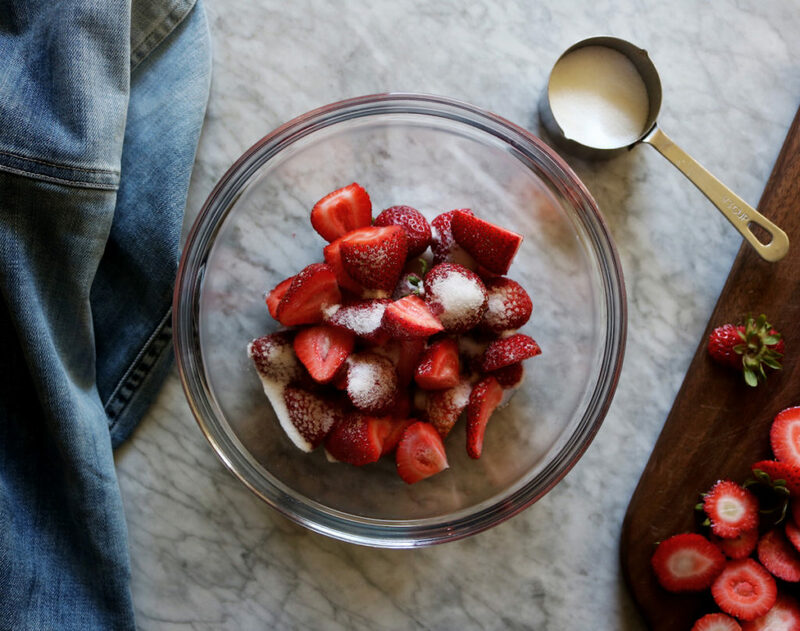 For the Strawberries: Add the remaining 2 cups of halved strawberries to a medium bowl. Add the sugar and fresh orange juice stirring to mix. Periodically stir so that all of the fruit is covered in juice. They're ready when they are glossy and releasing their juices. Using a sharp knife cut the strawberry scones in half. 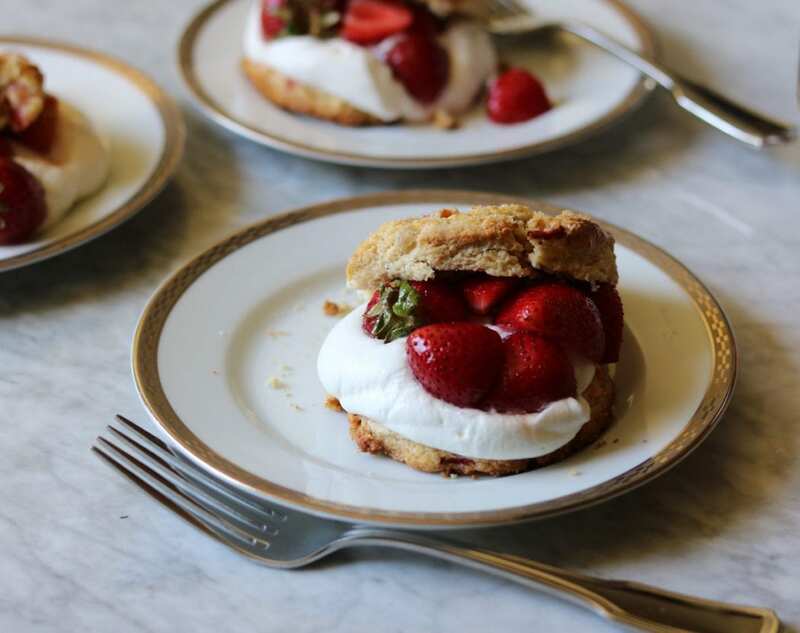 Top ½ with a large dollop of whipping cream, some strawberries and the other half of the scone. Enjoy! 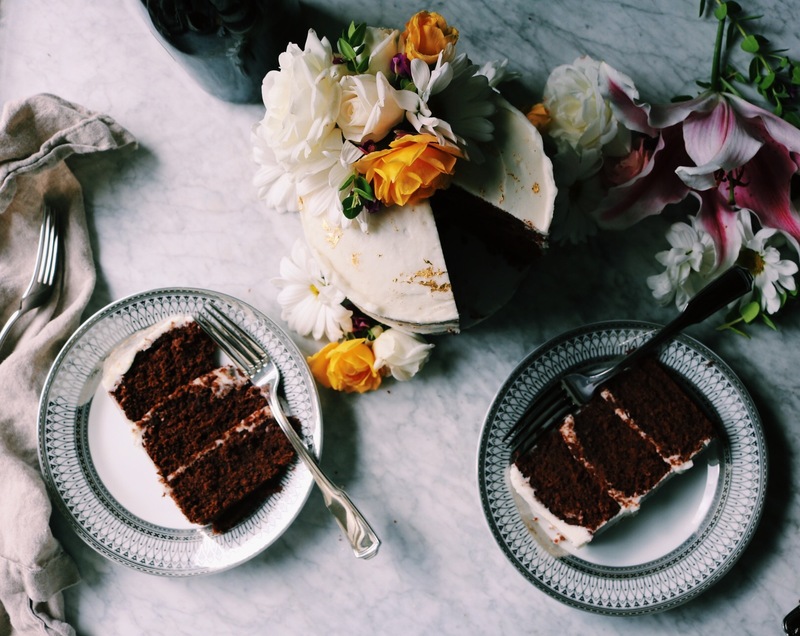 A fabulous potluck, Rebecca… and your morning sounds sublime. I’m completely with you… taking it slow. And because the days are SO long, it just feels like I have more time to do things I want, in the sunshine (not in the dark! hehe). The orange blossom water is in the pantry yet I’ve not used it yet. Your recipe gives me a good excuse. And I’ll take scones over shortcakes any day! Delicious and beautiful work! Strawberry scone-cakes?! I’m utterly smitten, and so in love with the strawberry orange combo! Love these beauties! Obsessed with these photos!!! And also obsessed with potentially drinking orange sugar off the rim of a glass…..
That sounds like the perfect relaxing breakfast! Glad your summer is off to a good start and you have found the perfect way to enjoy summer strawberries! I want to dig right into these babies! Yummmm these look so good! Also I wanna see a chicken yawn IRL. Ahhh ha haaaa!! It’s the best!!! You have to come visit!! These looks amazing! I’ll have to work up the courage to make them someday! Also, LOVE David Sedaris! These look SOOO GOOD I can’t wait to try out the recipe! I hope you do! Thanks Josh!! 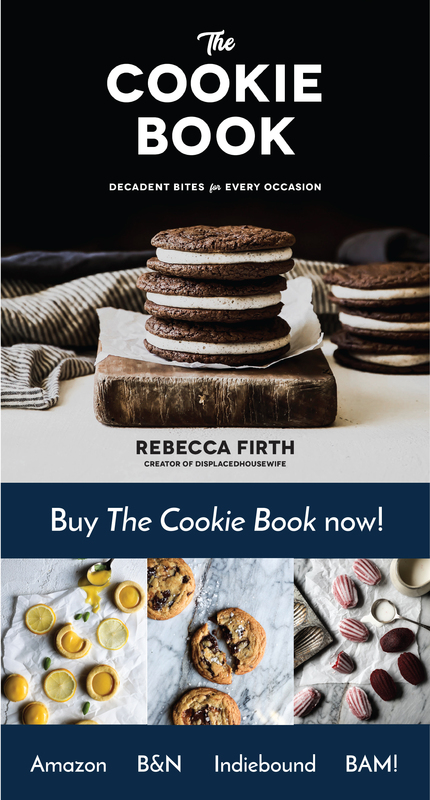 I am actually drooling thinking about these delectable scones Rebecca. Summer at your house sounds just dreamy!